If you are a Microsoft Access developer and are about to install Microsoft Office 2007 on a computer that already has an earlier version of Microsoft Access, read these instructions carefully or you may delete your old versions of Access. This article is important because the Office 2007 setup wizard deletes old versions as a matter of course. Tip: It would probably be a good idea to add a Restore Point using the Help and Support Centre of Windows XP before starting, if this is an option available to you. If you are a developer and had to support somebody using an Access 2002 database, you really should do this using Access 2002 rather than Access 2007. If you use Access 2007 you will have a lot of trouble with VBA references and you really won't know whether your software will work until your user tells you that it is working (in their version of Access 2002). The rest of this article will assume that you want to keep your older versions of Access/Office. 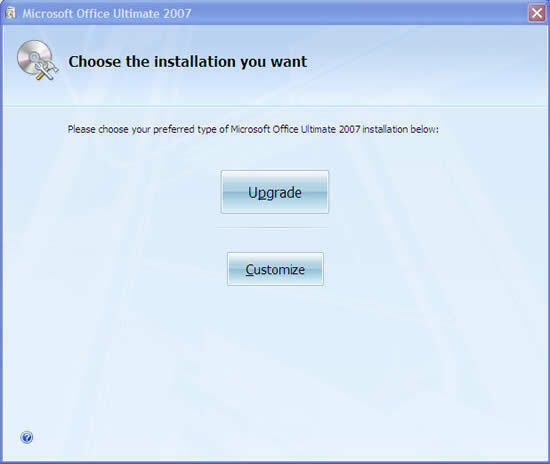 The first screen you will see after the registration form allows you to upgrade or customize your installation of Office 2007. If you are a developer you should always choose customize as it is good to know what you are installing. Anyway please pick Customize, failure to do so will wipe out your old versions of office. Install Now. 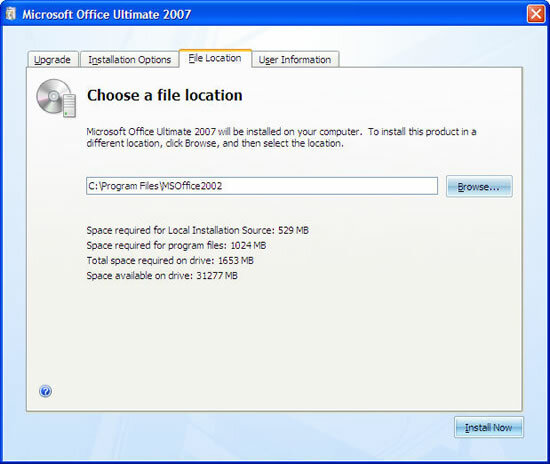 This option appears if you do not have an earlier version of Microsoft Office installed on your computer. This option allows you to run a complete installation with the exception of a few specialized files. Upgrade. This option appears if you have an earlier version of Microsoft Office installed on your computer. This option allows you to run a complete installation with the exception of a few specialized files. 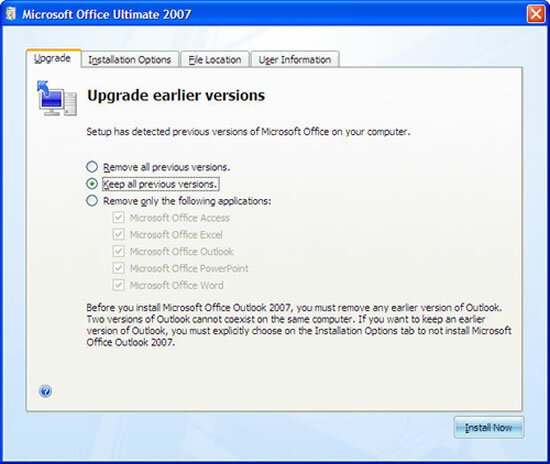 The earlier version of Microsoft Office detected on your computer is automatically removed. If you choose Keep Previous Versions, be aware that old versions of Outlook will be removed. At this stage, decide if you want the new Outlook or your old one. If you use Outlook automation as part of what you deliver to a client, you need to select the installation options Tab. If you like the version of Outlook that you are using and are not sure that the new version will be an improvement, you need to choose the Installation Options Tab. 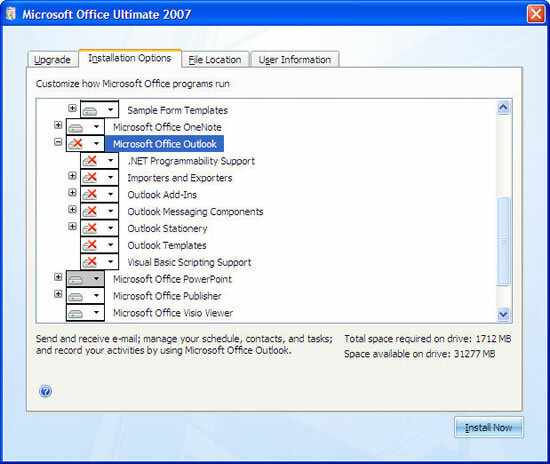 If you want your old Outlook program, unselect Outlook 2007 as shown below. If you really only want to test out Access 2007, don't install the other programs such as Word and Excel at all. It is easy to install them later. Word especially can cause problems where older versions of Outlook are concerned. It is very important that you look at this option, as you can see from the setup shown below, all the files were about to be installed in the same folder as my Office 2002 software. Installing in your old office folder will make life more confusing when you are trying to reference older versions of Excel or Word in VBA. The workbench for Microsoft Access allows you to define which version of access you are going to use to open a database. If you want to ensure that you are running the same software as your clients, you really need to open the right version of Access every time. If you use Microsoft Word as your editor in Outlook and you decide to keep Outlook 2003/2002, you will find some issues when it try's to fire up Word. When you switch from using Access 2002 to Access 2007, the following dialog takes a minute to resolve itself. Switching back to Access 2002 doesn't take so long. Article courtesy of Garry Robinson, Microsoft Access MVP, editor of the popular Microsoft Access website - vb123.com and creator of the Microsoft Access Workbench program.